This evening I made a super quick and easy Chicken Piccata and served it over Zoodle Pasta with Light Alfredo Sauce. It took less than 30 minutes to prepare. I used my Paderno spiral vegetable slicer to transform 4 small zucchini into "noodles" (zoodles). I have the original tri-blade version and they also have a new 4-blade version now. It took less than 5 minutes from start to finish. I really LOVE this contraption! I lightly salted the zoodles and spread them out on paper towels to wick out the excess liquid while I prepared the chicken. I lightly seasoned a little over a pound of chicken cutlets with salt and pepper and then sauteed them in olive oil over medium high heat for a couple of minutes per side. I placed the cooked cutlets on a baking sheet and placed them in a 325 degree oven to keep warm while I prepared the easy piccata sauce. I melted about 3 tablespoons of Kerrygold's Garlic & Herb Butter, in the same pan I cooked the cutlets in, over medium heat until it just began to sizzle. I squeezed in the juice of half of a lemon and added the zest of half of a lemon (about 1 teaspoon) into the sizzling butter and stirred it, scraping the browned bits of chicken from the bottom of the pan. I added about 2 tablespoons capers and then returned the chicken cutlets to the pan and spooned the lemony garlic herb butter and capers on top of the chicken and then covered the pan and set it aside to keep warm while I lightly cooked the zoodles. I heated about 1 tablespoon olive oil in a nonstick skillet and sauteed the zoodles for a couple of minutes, tossing frequently, until they just began to soften a bit. I added a couple heaping tablespoonfuls of sun-dried tomato pesto to the zoodles and then several heaping tablespoons of finely grated Parmesan cheese and a few splashes of heavy cream and tossed well to make a light sun-dried tomato Alfredo sauce. 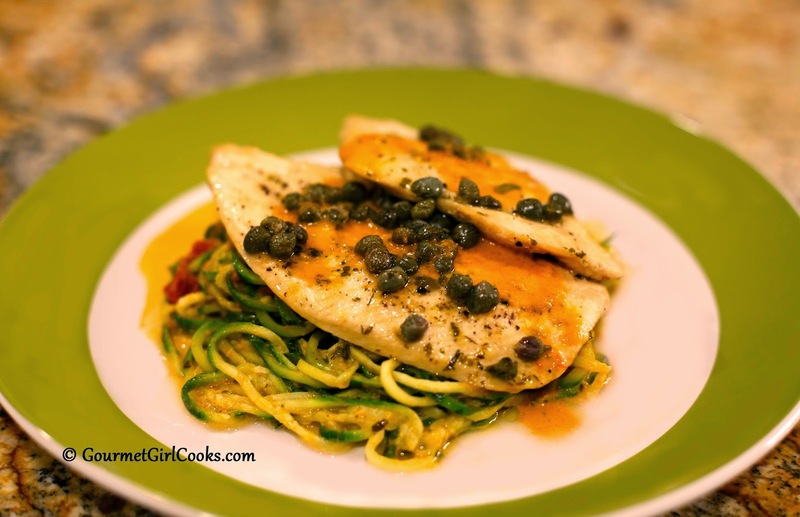 I served the chicken piccata over the zoodles and spooned the sauce over top. It turned out delicious and was so quick and easy to make. If you've never tried Kerrygold's Garlic & Herb Butter before, it's worth giving it a try if your store carries it. If you can't find it, you can simply saute some minced garlic in plain butter and add a couple teaspoons of minced parsley to make your own equivalent. I snapped a quick photo of this super flavorful and easy meal for you to see below. Enjoy! Before I purchased my "zoodle machine" I took a look at the comments on Amazon. People with the original 3-blade machine seem to be very happy with it. There were a lot of complaints about the newer 4-blade version. So I decided to get the original. It works great and I really like it. Sometimes it makes more sense to stick with the "original." It's not the first time that "new and improved" would turn out to be a flop! Great idea about comparing the comments on both models. When I got mine, there was only the 3-blade. I agree about sometimes being best to stick with the original!